The dietitian was no help to me! I have heard this comment at public meetings about managing symptoms that may have a diet component. There is a very good reason why this comment is important. People contact a dietitian to receive guidance about what the diet they need should be and how to manage it. They hope that something that is difficult can be made easy. If they are lactose intolerant, gluten intolerant, or need help with weight management they can get exact information on the foods they need to exclude and the foods they can eat. When they follow the diet plan the symptoms are solved and they feel satisfied and rewarded for their effort. Where does this go wrong with an elimination diet? Here the situation is different. Getting to the right diet may take three months. 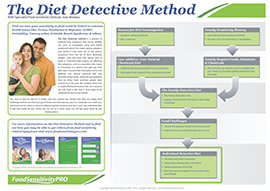 To investigate diet they need first to have help with to decide on an elimination diet that is made to be a good level of strictness to provide a baseline diet. Then there are worse symptoms as they go through the withdrawal phase. If they are not forewarned they may feel like giving up. After weeks on the baseline diet symptoms may have improved overall, but still come and go. Frustration that all is not solved can happen. They do need to do challenges to clarify the food chemicals or whole foods they definitely react to. And then they need to expand the diet using food chemical charts or single food trials, to find their own diet. Often people have severe problems, such as a distressed baby with sleep and reflux problems, or a child with many behavioural problems, or they may be an adult who seems especially sensitive. They start with high motivation and may manage the elimination diet well for awhile, not wanting to lose the good results they got. They then have to do challenges but the diet is still difficult to maintain. This amount of restriction is another source of frustration. As well most are sensitive to smells and chemicals in the environment. Since no-one can control the environment easily this can be another source of frustration. They may be managing behaviour problems in a child as well, and that has ups and downs. As well each person is different. If this is happening to you, you will find that what you tolerate is not the same as your friends also investigating diet and this can be another source of frustration. Tolerance may be similar to other family members, but not exactly the same, and that is yet another source of frustration. It is no wonder families do not feel satisfied or rewarded for diet effort. Overall, we need to separate diet investigation from other types of diet therapy. The dietitian cannot help unless you attend when it is suggested. That way you can have a definite plan, and your questions answered. You need all the help you can get. Use my book Are You Food Sensitive? as a guide, and/or the RPAH handbook, as well use a dietitian. This does not mean it will be a quick solution but with professional help you get to the diet that is right for your family sooner than you would on your own. You learn to be comfortable with the idea that it will not be as neat as other diet management.